Isle Royale is a national treasure. Only 45 miles long and 8 miles wide, Michigan’s Isle Royale offers the nature lover scenic splendor, solitude and a true wilderness experience. Situated just 14 miles from the Canadian border, it is one of the rare island national parks in the United States. 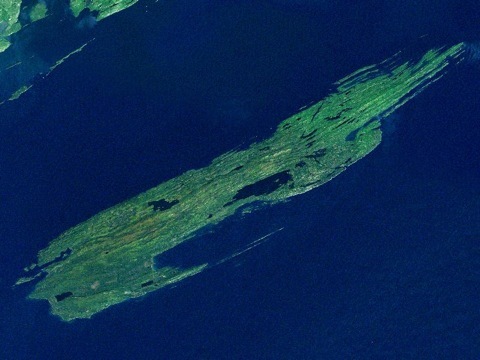 Four lighthouses stand guard over the waters of this island at the northern edge of Lake Superior. 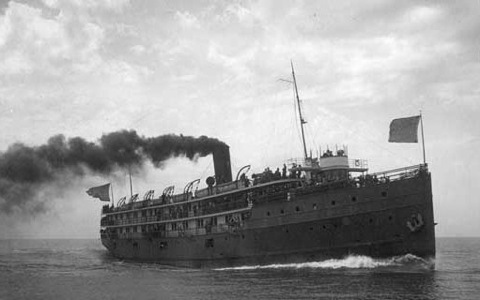 Although the island might seem too remote to require a lighthouse, Isle Royale and the nearby Keweenaw Peninsula produced one thing that drew numerous ships to the area: copper. Native Americans mined copper on Isle Royale for centuries. Archaeologists have discovered ancient shallow mining pits on Isle Royale over 4500 years old. However Europeans did not take advantage of this mineral resource until the mid 19th century. The island became part of the United States in 1783, and fell under the control of Michigan in 1837. Fishing camps sprang up on the island in the early 1800s, followed by trading posts intent on acquiring fur from the Native Americans. But an economic depression in 1841 effectively ended most of the fishing and fur trade. Fortunately another event happened that year that jump-started the island’s economy. Geologist Douglass Houghton’s discovery of a copper boulder in 1841 set off a ‘Copper Rush’ to the Keweenaw Peninsula. Modern exploration for copper mining began in 1843. By 1850, a number of mining companies had set up operations in the area surrounding Isle Royale. The influx of miners and speculators led to such increased traffic that a half-dozen lighthouse stations were built. Vast sections of the island were burned and logged in order to implement copper mining. This mining activity attracted settlers to the island. Many of these newcomers were involved in mining or shipping, but others came to the island for a summer retreat. The island’s great natural beauty drew people eager to experience life in the fast vanishing wilderness. Even before the island became a national park in 1940, the turbulent waters of Lake Superior demanded the construction of lighthouses to protect mariners. In 1855, the stone and brick Rock Lighthouse was the first to be lit. In 1875 the entrance to Siskiwit Bay saw the completion of the $20,000 Isle Royale Light. In 1882 America’s northernmost Great Lake lighthouse, Passage Island Light, was first lit at Thunder Bay. Finally in 1908, the 117-foot tall Rock of Ages Lighthouse was activated. Built to handle the traffic connected to the island’s copper mining, these lighthouses became automated or abandoned when the island’s copper mines stopped operating in 1910. The first light station on Isle Royale was built at Rock Harbor on the northeastern end of the island. To help facilitate shipping in Lake Superior, Congress authorized the building of the first Soo Lock in 1852. By 1853, the increased shipping traffic prompted Congress to appropriate $5000 for the construction of a lighthouse at Rock Harbor. At that time, it was Isle Royale’s main port and shipping hub for copper, fur and supplies. The Soo Lock opened in 1855. The following year construction began on the new lighthouse at Rock Harbor. When completed, the station consisted of a one-and-a-half story keeper’s house attached to a 50-foot cylindrical white tower. An octagonal beacon and copper roof capped the brick and stone tower, while a Fourth Order Fresnel lens provided illumination. Soon after the arrival of its first lighthouse keeper in October 1856, the station was activated. After only three years of operation, copper mining had decreased to such an extent that the lighthouse was deemed unnecessary. The keeper closed up the house and extinguished its light in August 1859. But the onset of the Civil War led to a renewed demand for copper. Mining on the island – along with the corollary shipping traffic - increased yet again. Rock Harbor Lighthouse underwent renovations in 1873. A year later, it was reactivated. However the fluctuating demand and price of copper once again led to the lighthouse being deactivated on October 4, 1879. Several structural changes occurred in the 20th century: dormers were added to the lighthouse keeper’s house in 1910, the tilting tower had to be stabilized in the 1950s, and asphalt replaced the 19th century wooden roof in 1962. The unmanned lighthouse became listed on the National Register of Historic Places in 1979. Visitors cannot walk to the lighthouse, but several boat trips to the station are available. The National Park Service operates a museum at the lighthouse, and visitors are allowed to climb the tower. 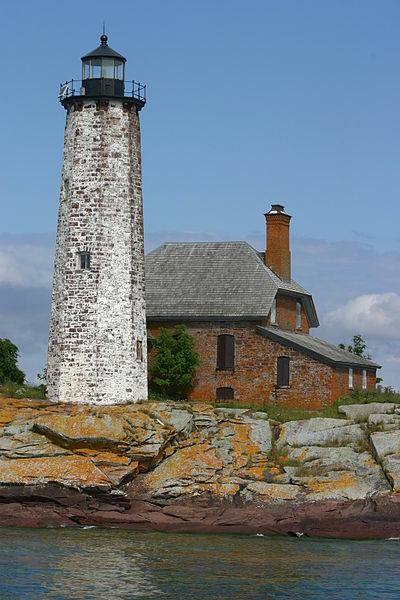 Since Isle Royale Lighthouse is located on nearby Menagerie Island, it is also referred to as Menagerie Island Light. One of several small islands in Siskiwit Bay, Menagerie Island is approximately 2.5 miles off Isle Royale’s southeastern shore. 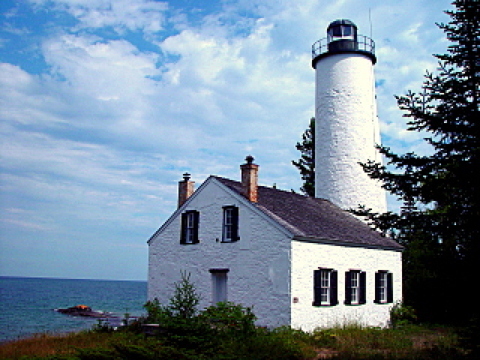 The construction of Isle Royale Light was a factor in the deactivation of the lighthouse at Rock Harbor. The new light station guided traffic into Siskiwit Bay’s harbor, which became the main port for shipping the copper located nearby. The smaller Rock Harbor simply could not compete. The Isle Royale Lighthouse station is comprised of four buildings and a 61-foot octagonal sandstone tower. To make the tower more visible, it was whitewashed, and its lantern and gallery painted a contrasting black. The Fourth Order Fresnel lens was first lit in 1875 and had a range of ten miles. Initial construction of the light station included a two-story keeper’s house made of sandstone, a wooden shed and a brick privy. The addition of a concrete building used to store oil occurred in 1906. In 1913 the station underwent automation. Throughout the 20th century the lighting system changed from the Fresnel lens to acetylene to batteries and finally solar power in 1993. Isle Royale Light became part of the National Register of Historic Places in 1983. Passage Island Lighthouse has the distinction of being the northernmost American lighthouse on the Great Lakes. Located eight miles from Rock Harbor and 3.5 miles northeast of Isle Royale, Passage Island Light guides maritime traffic through a narrow channel into Thunder Bay. Along with Isle Royale, Passage Island benefited from the copper, silver and nickel mining taking place in the Upper Peninsula. It was apparent that a lighthouse was necessary to help guide ships through the deep-water passage between Isle Royale and Passage Island. Congress approved monies for the building of Passage Island Lighthouse in 1875. But the $18,000 funding didn’t materialize until 1880 due to Congressional politicking with Canada over the building of a Lake Erie lighthouse. Construction on the lighthouse finally began in 1881. The Lighthouse Board placed the lighthouse at the southern end of Passage Island in order to warn ships of the deepest part of the channel’s northern edge. Building was completed the following year. The Fourth Order Fresnel lens was first lit in its 44-foot tall tower in 1882. Crowned with a ten-sided cast iron lantern and fixed red light, this natural fieldstone tower has a square base and an octagonal upper level. The Norman Gothic style of the tower is mirrored in the two-story keeper’s house, which is also built of fieldstone. This particular Gothic style can be found at other Great Lakes’ lighthouses such as Eagle Harbor, White River, Squaw Island, McGulpin’s Point and Sand Island. In 1884, a steam operated fog signal was added to the station. A white flashing lens from Paris was installed ten years later. The station became automated in 1978, and eleven years later an acrylic lens replaced the Fresnel in the lighthouse’s red and white lantern. In 2006 Passage Island Lighthouse joined the list of the National Register of Historic Places. Although the Coast Guard owns Passage Island Lighthouse, it is currently leased by the National Park Service. Isle Royale offers tours that transport visitors by boat to Passage Island where park rangers lead hikes to the lighthouse. Unfortunately the lighthouse is closed, but visitors may explore the grounds. Prior to 1870, anchored lightships were used as guidance systems near remote islands, shoals and reefs where navigational conditions were treacherous. However these ships were just as vulnerable to the severe storms on the Great Lakes as the vessels they were trying to aid. To remedy this, a number of light stations were constructed near isolated areas from 1870 to 1910. One of these stations was Rock of Ages Light. Located on a rocky reef 3.5 miles west of Isle Royale and approx. 2 miles west of Washington Island, Rock of Ages was first lit in 1908 with a temporary light. This was replaced in 1910 by a 2nd Order bivalve Fresnel lens which flashed twice every 10 seconds, and could be seen for 17 miles. Constructed of concrete, masonry and steel, the 117-foot white conical tower had a black base and lantern. The design of the tower is similar to Chicago Harbor Light, which was built in 1893. 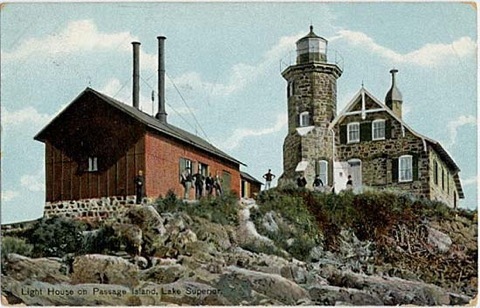 Rock of Ages Lighthouse contained a bunkhouse, galley and mess hall. When the shipping season began each spring, a crew of keepers was brought to the station. They remained at Rock of Ages until the season wound to a close in late fall. An assignment to Rock of Ages was not taken lightly. The station was so inaccessible that delivering provisions to the crew was sporadic and difficult. One year things became so dire that only one can of tomatoes was left when the crew was picked up at the end of the season. The lighthouse was built on a rocky outcropping long known to be hazardous. The reef was responsible for the wrecks of the Cumberland and the Henry Chisholm in 1870 and 1880 respectively. These sunken ships were joined by another wrecked vessel in 1933 when the steamer George M. Cox crashed against the reef in a heavy fog. Although the lighthouse foghorn warned them of the danger, the Cox was traveling much too fast. Fortunately the passengers and crew were able to safely evacuate the ship. Lighthouse keeper John Soldenski towed the life rafts back to the lighthouse with his gas-powered boat, and the 127 survivors spent the night on the reef. 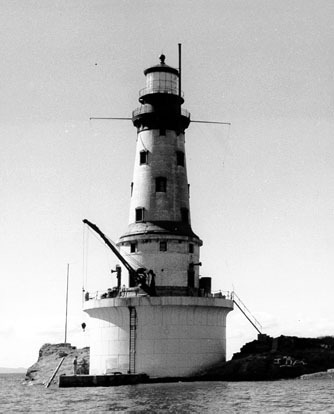 After 68 years of service by lighthouse keepers, Rock of Ages was finally automated in 1978. Seven years later, a solar energy powered light replaced the Fresnel lens. Now closed to the public, Rock Island can be accessed only by boat. However it is visible by ferries traveling between Isle Royale and Grand Portage, Minnesota. In 1983, Rock of Ages was added to the National Register of Historic Places. Accessible only by seaplane or boat, Isle Royale is remarkably unchanged from the island which greeted visitors a century ago. This is a true wilderness park where exploration is by foot, kayak or canoe; cars and bikes are not allowed. Visitors are instructed to boil their water and bring everything they need – including food. Everyone must also carry their refuse and garbage off the island at the end of their stay. Since reaching the island by boat from either Minnesota or the mainland of Michigan takes from two to six hours, most people who come to explore the park stay an average of three days. A rugged and spectacular wilderness experience awaits visitors to Isle Royale. But along with the forests, waterfalls, moose and wolves, island backpackers should remember to check out at least one of the historic lighthouses which stood guard over the vast waters of northern Lake Superior. Great Lakes Lighthouse Tales by Frederick Stonehouse, Avery Color Studios Inc., 1988.